This page will guide you through configuration and basic use of the CRM Connect NetSuite Add-in.It is expected that you are already familiar with the Address Book, Call History and Preview window, and the basic concepts of integration and screen popping using the Add-ins.See the 'User Guide' for these topics. Right-click the CRM Connect tray icon in the system tray menu and then left-click the 'Configuration' option from the menu that pops up, this will open the 'configuration' screen.In the 'Integration' area, click the 'Add new' button, select 'NetSuite' from the 'Type' dropdown box and then click the 'Set' button. In the 'Account' box, you need to enter your NetSuite account number. 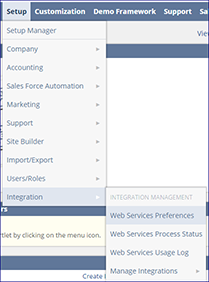 NetSuite 2015 users:You can find your NetSuite account number by logging into your account and clicking on 'Setup » Integration » Web Services Preferences' from the tabs near the top of your dashboard. 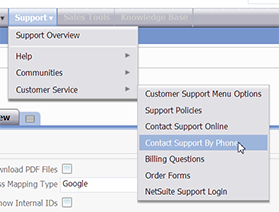 Other NetSuite version users:You can find your NetSuite account number by logging into your account and clicking on 'Support » Customer Service » Contact Support By Phone' from the tabs near the top of your dashboard. Back in CRM Connect, enter your email and password into the appropriate text boxes. To test if the configuration worked, enter a phone number from your NetSuite account into the 'Telephone' box in the 'Integration test' area and click the 'Search' button.The results will be displayed after a few seconds. When a call comes in, the CRM Connect 'Preview Window' will pop up and display the phone number that is calling.If the caller is recognized as one of your contacts from NetSuite, their details will also be displayed and you can 'pop' their NetSuite contact record by clicking the 'NetSuite' button in the window. You can also pop recognized callers' NetSuite contact records by clicking the 'NetSuite' button on the 'Phone Window'.